I need to dance more. Anyone who really knows me knows that I do dance. I dance in musical theater. I dance at the annual medical ball which, believe me, has little else to recommend it in terms of entertainment. And here’s a tidbit of trivia for you-I belonged to the ballroom dance club in college. I won the the father-daughter dance contest my senior year in high school. Well, my dad and I won it. That’s not something you can do alone. I went to the disco every Sunday afternoon in high school. Yes, go ahead and laugh. But to this day I can do a mean swing dance. I’m just way more likely to turn an ankle than when I was seventeen. But this week, I was startled by a kind of dance I don’t do enough of. Joyful dancing. Have you ever prayed to be rid of a fear and then, when you got what you asked for, continued to be fearful? Or manufactured another fear to take its place. When I was a kid, I was afraid of the dark. Okay, I’m still a little afraid of the dark, but now I have better coping skills. You remember the drill when it was bedtime? Check in the closet for monsters. Or scary animals. Or serial killers in clown masks with pitchforks. I had a very vivid imagination. Sigh in relief when no monsters show their face. Even after you got up the nerve to check under that suspicious three-foot pile of dirty laundry your mom was always bugging you to bring down. But then . . . Got to check behind the curtains to be safe. And behind the door. And in the bathroom. Don’t forget behind the shower curtain. When it’s finally safe to get in bed, you suddenly realize you’d better not dangle toes or fingers over the edge of your bed because heaven knows what is lurking under it that could grab your hand and pull you under. This was, I have to admit, a very real possibility the way I kept my room as a kid. I want to suggest an alternative to this slightly deranged frenzy. 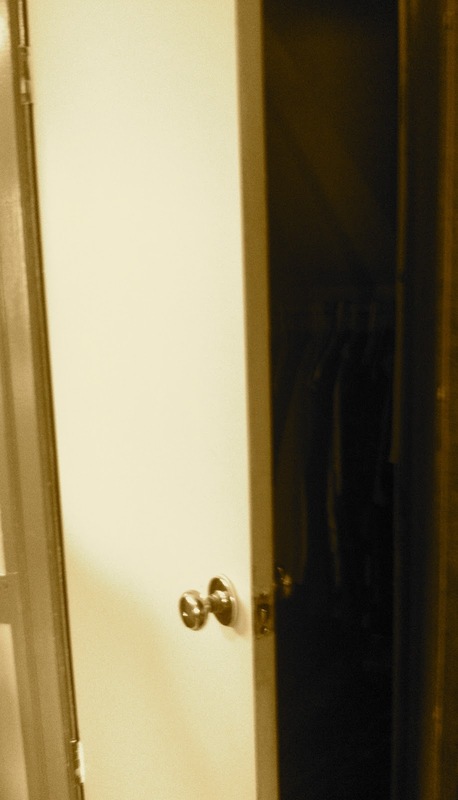 If the closet is clear, how about we do a dance of joy in the middle of the room and yell, “Praise God–my closet is all OK!” Or something a bit more creative, if you like. But we don’t, do we? We find more things to be afraid of, more worries to imagine, more concerns for the future that, while certainly possible, blind us to the moment that deserves a dance. I’ve had a lot desperate prayers answered over the last few years. Many things that could have gone tragically wrong did not. I’m not saying this in a hypothetical fashion; God really has pulled people I love deeply off the road to a devastating end, and I have wept for others who failed to get off the road. I recognize the terror I have stared down. I know I have a lot to dance about. But instead, I too often find myself focusing on what is yet not right. I look under the bed for the relationship that is still damaged. I peer into the closet at the habits that still need reform. I sweep back the shower curtain searching for what still is imperfect. And I totally miss the fact that what is now is so much better than what was. I should be thanking. And I should be dancing. Psalm 34 says, “I prayed to the Lord, and he answered me. He freed me from all my fears.” If you’ve been free from even the smallest thing, take time today to dance. Stop worrying about new things that may come. Stop focusing on what is not, and where you would like it to be. Look gratefully at what is. And dance. Ah, what an encouraging article. Thank you Jill for sharing this. I know all about fears and new ones popping up to replace old ones. But, God has not given us the spirit of fear. He does want us to dance with praise and joy for He has pulled us out of the pit over and over. And since you mentioned it, I love to dance–shag is my favorite–but I rarely do anymore. Hey, let me go look in the closet for some dancing shoes! I love joy dancing! Actually, I think joyful dancing, thanks and praising God will scare the rest of the monsters right away! Or, they will all leave in disgust–who cares, they are gone! Nice thoughts, Jill. Thanks for sharing and encouraing us to go outside the box with our private worship too. shoes are entirely optional, Rose! agreed! Far better for us to do the scaring. Thanks, Lisa. We all need that nudge every once in a while. You're right–we do need to dance like this more often! It's very freeing, and I think God likes it, too.